Federation Personnel of Human species. Commander: U.S.S. Enterprise-D. When your Leadership personnel present is killed by a dilemma, you may discard two cards from hand to download a personnel. "You have the bridge Number One." Characteristics: affiliation, download, download - personnel, Next Generation related, discard a card from hand, Commander, personnel who has a cost of 3 or more, William T. Riker, Human species. 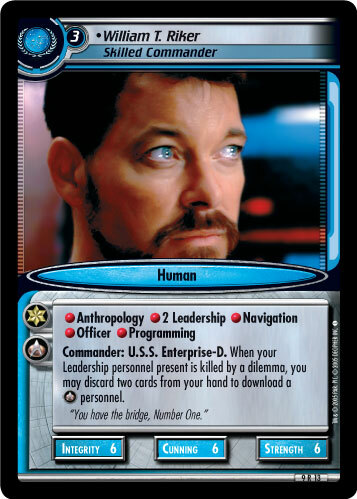 There are 18 entries for William T. Riker, Skilled Commander (ST2E 9 R 13) at the Tradeplace (22 haves and 6 wants). Click here to see all trade list entries for this Rare card! Also see here for all trade lists with any card fom "Dangerous Missions".